342 pages | 1 B/W Illus. 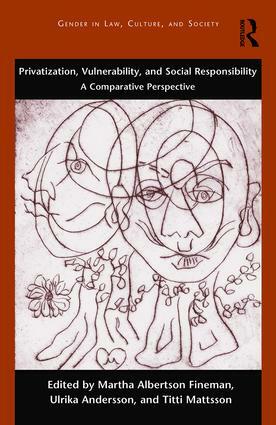 Taking a cross-cultural perspective, this book explores how privatization and globalization impact contemporary feminist and social justice approaches to public responsibility. Feminist legal theorists have long problematized divisions between the private and the political, an issue with growing importance in a time when the welfare state is under threat in many parts of the world and private markets and corporations transcend national boundaries. Because vulnerability analysis emphasizes our interdependency within social institutions and the need for public responsibility for our shared vulnerability, it can highlight how neoliberal policies commodify human necessities, channeling unprofitable social relationships, such as caretaking, away from public responsibility and into the individual private family. This book uses comparative analyses to examine how these dynamics manifest across different legal cultures. By highlighting similarities and differences in legal responses to vulnerability, this book provides important insights and arguments against the privatization of social need and for a more responsive state. 12. Still a responsive state? 14. What does privatization mean for women in Uganda? Martha Albertson Fineman is Robert W. Woodruff Professor of Law at Emory University. A leading authority on family law and feminist jurisprudence, Fineman is the founding director of the Feminism and Legal Theory Project, an interdisciplinary scholarly project she began at the University of Wisconsin in 1984. Since 2007, she also directs Emory’s Vulnerability and the Human Condition Initiative, an interdisciplinary project housed in the Laney Graduate School. Her scholarly work focuses on various aspects of the legal regulation of intimacy and on the social, cultural, and legal implications of human dependency and vulnerability. Titti Mattsson is Professor of Public Law, working as a researcher and teacher in social welfare law, medical law and family law at the Faculty of Law, Lund University. Her research broadly concerns age and the law (child law, elder law) and often focus on the use of age as a simplifier in the regulation of the social welfare state. Together with Andersson, she is co-director of the research environment Law and Vulnerabilities at Lund University. Ulrika Andersson is Associate Professor in Criminal Law at the Faculty of Law, Lund University, working as a teacher and researcher in criminal law and criminal procedural law. Her main research focuses broadly on questions concerning law and power. She is particularly interested in issues of sexuality and gender, in addition to power relations in regard to class and ethnicity.